UK: Can Javid Stop The Boats? "A question has to be asked: if you are a genuine asylum seeker, why have you not sought asylum in the first safe country that you arrived in? Because France is not a country where anyone would argue it is not safe in any way whatsoever, and if you are genuine then why not seek asylum in your first safe country?" — British Home Secretary Sajid Javid. Asylum seekers in Britain are entitled to free accommodation, cash support at £37.75 per person per week, free healthcare, free dental care, free eyesight tests, free glasses, maternity grants and free schooling -- much to the chagrin of many British nationals and former service personnel who do not have access to many of these benefits. Another tragedy of Alan Kurdi proportions is only a matter of time. The media are poised and salivating at the prospect of capturing this impending disaster for their front pages; the hackles of a hundred migrant and refugee charities are raised in anticipation of the PR opportunities ahead of them. Sajid Javid is a rising star in the British Conservative party. If he can stop the boats across the Channel, he will be perfectly positioned to take control of the British Conservative Party as well as the rising migrant crisis. The British Home Secretary, Sajid Javid, has called in the Royal Navy to help deal with the migrant crisis in the Channel. Since November, 239 migrants successfully made the crossing from Calais, France to Dover, England in small inflatable boats. A total of 539 migrants tried to make the crossing in 2018. According to the Daily Mail, "Most of those held by police crossing the world's busiest shipping lane from France since November have claimed to be Iranian." Whether this is factually correct, or a line given to them by the people smugglers they pay for their journey, is a reasonable question. According to UK immigration lawyer Colin Yeo, "The latest asylum statistics show that around three-quarters of Iranian asylum claims succeed," -- a fact the people-smugglers presumably know well and capitalise on for profit. "A question has to be asked: if you are a genuine asylum seeker, why have you not sought asylum in the first safe country that you arrived in?... Because France is not a country where anyone would argue it is not safe in any way whatsoever, and if you are genuine then why not seek asylum in your first safe country?" Predictably, Javid has been vilified by the 'Left' for daring to ask an obvious question that requires an answer; was accused of "normalising anti-refugee rhetoric" by Labour MP Stella Creasy, and was used for political point-scoring by the Liberal Democrats, whose Home Affairs spokesman, Ed Davey, said that Javid's remarks "show that the Tories' nasty, hostile environment is alive and well". This political game of ping-pong is predictable and well worn, practised on both side of the Atlantic: Sajid and Trump taking a principled stand and defending borders, to the relief of taxpayers and the silenced majority; the liberal elite in their splendid isolation, protected by their wealth, arguing on behalf of the illegals. A look at the numbers might suggest this is a migrant storm in a teacup, and that recalling two UK Border Patrol vehicles and calling in the Navy to the Channel is a right-wing overreaction to a relatively small problem. Crossings cannot be tallied definitively, but the Home Office knows of 539 migrants who tried to cross the English Channel by boat in 2018, which is probably far fewer than the number who came by lorry. Only 312 completed the journey (the rest were caught). The numbers belie a known truth: there are tens of thousands of migrants trying to break into Britain, biding their time on the coast of France until they can fund or find a way across. 113,145 illegal immigrants made it across the Mediterranean last year. "Several hundred Iranians made it to Calais via Serbia between August 2017 and October 2018, after Belgrade temporarily dropped a visa requirement. Most speak English and are keen to work." An Iranian asylum seeker who made the treacherous journey across the English Channel in a small boat just over a fortnight ago told UK Channel 4 that "the combination of the harsh conditions in France and the poor exchange rate are behind the spike in asylum seekers risking the crossing." England is seen as the land of milk and honey for many: its asylum claim process allows migrants to stay freely in the UK whilst their asylum claim is considered. Asylum seekers are entitled to free accommodation, cash support at £37.75 per person per week, free healthcare, free dental care, free eyesight tests, free glasses, maternity grants and free schooling -- much to the chagrin of many British nationals and former service personnel who do not have access to many of these benefits. Asylum-seekers (real or fraudulent) know their rights. "The outcome of an asylum application cannot be pre-judged before it has been made and must be processed on its individual merit, irrespective of how that person reached the country," Dr Lisa Doyle, Director of Advocacy at the Refugee Council, reminds us. Colin Yeo, a leading immigration and asylum barrister at Garden Court chambers, told The Guardian that Javid's apparent threat to reject applications was illegal: "I imagine the Home Secretary knows this, but if so it is depressing that he is still saying it as a way of trying to make himself sound tough." The contrast between legal and humanitarian arguments and the reality on the ground, cheek to cheek with the migrants themselves, is stark. I have spent time in the migrant camps of Calais, formerly known as 'The Jungle', and have seen at first hand the lengths to which migrants will go to make the crossing. They will cut through chain fencing, throw railway sleepers under the wheels of lorries to try and get on board, and physically battle the French police and their tear gas. Our photographer, almost lynched by the mob for his camera gear, had to be 'repatriated'. The numbers might suggest this is not yet a migrant crisis -- but imagine the political and humanitarian furor when one of these crossings in an inflatable boat goes horribly wrong. The picture of little Alan Kurdi, the drowned Syrian Kurdish boy who washed up in Turkey, is indelibly etched into our consciousness. The photograph reportedly resulted in Chancellor Angela Merkel opening Germany's borders to a massive wave of migrants, a political decision for which German nationals and most Western Europeans continue to pay the price. The birth of the populist movement across Germany, Sweden, Italy, Austria, Hungary and Poland is a labour of Merkel's making. She may not have children of her own, but she is seen by many as the Mother of all Migrants and the catalyst for the resulting populist surge. Another tragedy of Alan Kurdi proportions is only a matter of time. The Channel crossing is spectacularly hazardous, home to the famous Dover Strait, according to Guinness World Records "the world's busiest shipping lane". Approximately 500-600 ships a day pass through this narrow strait between the UK and France, carrying oil from the Middle East to European ports and various commodities from North and South America to European customers. The media are poised and salivating at the prospect of capturing this impending disaster for their front pages; the hackles of a hundred migrant and refugee charities are raised in anticipation of the PR opportunities ahead of them. 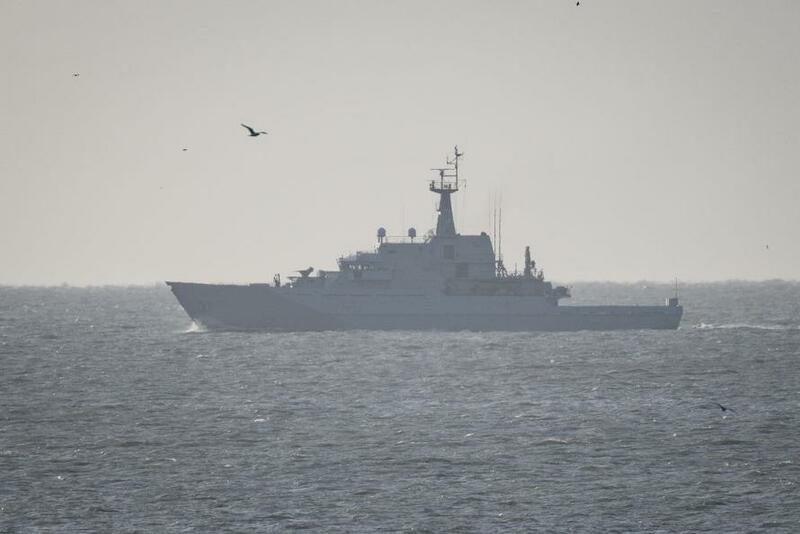 "Gavin Williamson, the defence secretary, immediately responded by despatching HMS Mersey, an offshore patrol vessel, to the Kent coast, while the Royal Air Force will provide aerial surveillance." HMS Mersey will operate there while two Border Force patrol boats return from the Mediterranean, a redeployment likely to take several weeks. This is something of a radical change in the dynamics at play in the UK. It is a remarkable demonstration of action and determination by a British government perceived as weak and ineffective on Brexit and a soft touch on terror. For the first time in a long while, it gives a semblance of hope to many patriotic Brits who voted for Brexit precisely in order to take back control of British borders and have a say in who gains access to the island on which they live. Sajid Javid is a rising star in the British Conservative party. His tough line on migrants, particularly Muslim migrants, is precisely the salve needed to soothe the anger of the British nationals frustrated by political obfuscation over Brexit, disgusted by the mostly Pakistani grooming gangs, and targeted by terrorists. "When I heard about grooming gangs where almost every individual involved is of Pakistani heritage, I can't help noting that. But I can't help noting the fact that Rochdale is a town that means something to me and I'm also of Pakistani heritage." "I'm the British home secretary," he said. "My job is to protect the British public." His actions suggest he intends to do exactly that. If Sajid Javid can stop the boats across the Channel, he will be perfectly positioned to take control of the British Conservative Party as well as the rising migrant crisis.